Package size about 41.2*5*28cm.Only 1 car is electric.1 AA requested(not included). 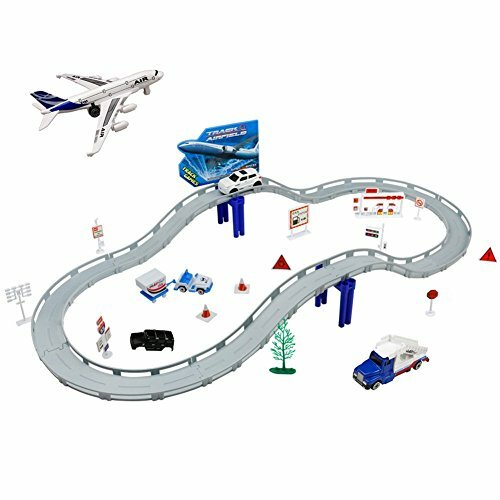 Total 31 pcs, including 1 plane, 4 vehicles, 1 car shell, series of track accessories and road signs. Various accessories allows kids to create their own track which can improve their hand-on ability and logical thinking. Great toy for kids, kids can simulate different scenes with their friends, also help to cultivate their imagination and teamwork ability. Warning: CHOKING HAZARD-Small parts, not for kids under 3 years. Should be used with adult supervision.